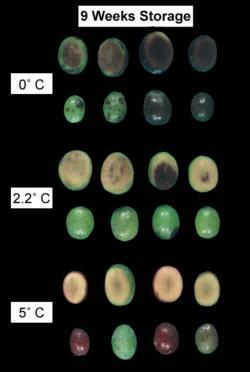 The incidence and severity of chilling injury (CI) on fresh olives depend on storage temperature and duration as well as cultivar. The order of susceptibility to CI is Sevillano (most susceptible) - Ascolano - Manzanillo - Mission (least susceptible). Importance: CI can be a major cause of deterioration if fresh olives are stored before processing for longer than 2 weeks at 0°C (32°F), 5 weeks at 2°C (36°F), or 6 weeks at 3°C (38°F). Kader, A. A., G. D. Nanos, and E. L. Kerbel. 1990. Storage potential of fresh ‘Manzanillo' olives. Calif. Agr. 44(3):23-24.